Happy Monday friends! I took an unintentional break from the blog on Friday after a hectic week at work, an event than ran a little later than I was anticipating on Thursday and getting sucked into 13 Reasons Why on Netflix - I decided it was okay to just be. I'm finishing up the #CaliforniaRoadTrip today with a broken down itinerary! After we got back from our trip, this was the most requested post I have ever been emailed about - so here we go! 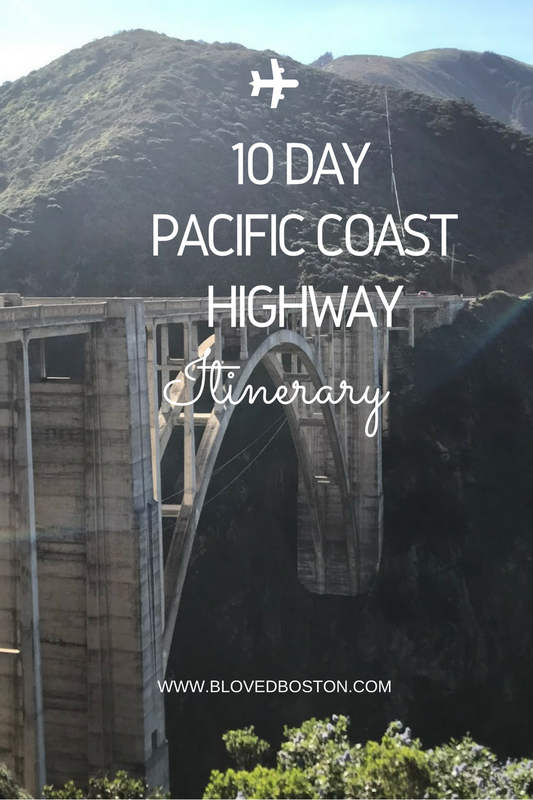 When researching the Pacific Coast Highway and the trip up and down the coast, I was having a hard time figuring out how long to stay in each spot, what to see and do & which stops were worth an overnight stay (or longer). The more time I spent researching the more I found that people took 7 days or less to do the trip, which worked out for us because we tacked on 2 days on the tail end of our trip for San Francisco, getting us to a total of 10 days in California. 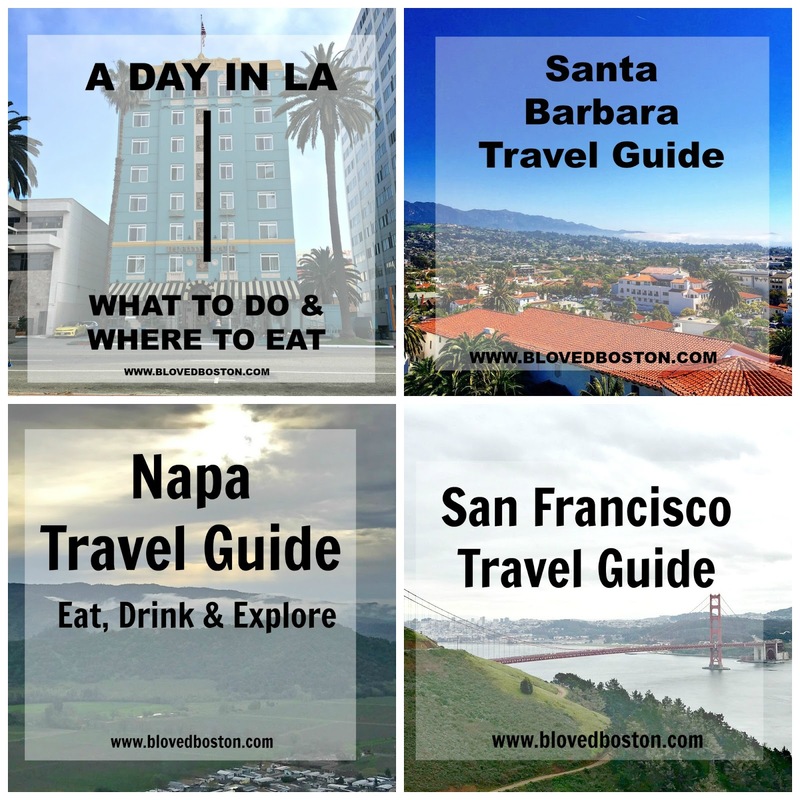 The first thing to consider is whether you'll be doing the trip from North to South or South to North - based on ticket prices and wanting to relax in Napa before the end of our trip - we decided flying into Los Angeles and departing back for Boston from San Francisco made the most sense for us. Everything else is honestly up to your personal preference. For example, if you're an outdoorsy person then Big Sur is going to be a larger part of your trip because there are national forests to explore and hikes that you can take. For us, this wasn't a big draw, so we didn't plan an overnight around Big Sur - which is a good thing since the national park was closed due to weather. We also didn't add time into relaxing on the beach on the drive - there are a lot of beaches that you can pull off the road to enjoy, but it wasn't something we wanted to spend time exploring - we decided it was more important to us to actually sight see in the cities. I was surprised to find that there wasn't any major traffic back ups on Highway 1 - occasionally you would go a bit slower because you're taking in the scenery, but for the most part it's still a highway and you can have increased speeds. My biggest piece of advice - if you can, rent a convertible to drive the PCH. It's worth it! And with that - I am officially done recapping our California Road Trip. If you have any questions about any of the planning feel free to comment below or email me! Is the trip do-able in 7 or even 5 days, absolutely - but I do think you'll find yourself rushing through stops and even deciding against certain stops because you just don't have enough time. Even with 10 days, I felt like it wasn't enough time to explore so I would absolutely go back and explore some of our favorite cities like Santa Barbara and Carmel-by-the-Sea again. I would definitely have a hard time deciding how many days to spend in each place! And that's awesome you rented a convertible -- I feel like that's the only way to see the Pacific Coast Highway! Happy Monday! So many great places! How fun is the convertible?!! Whoohoo like a movie star cruising the Pacific Coast! You guys did this trip right! I feel like you spent enough time in each area to really get a feel for Cali. What amazing memories! Happy Monday beautiful! Oh my goodness, 13 Reasons Why....such a binge worthy series. The book is great! Anyway, this guide is so good, I loved reading about your stops along the way! This is a fantastic post girl! Definitely saving for hopefully future use! What was your favorite part of CA? I love that the entire state is so different and southern CA is different from northern CA! You guys are lucky that you didn't have any traffic backed up on the highway! We went Labor Day weekend and when we went through Malibu, the traffic was literally bumper to bumper going about 15 miles per hour and starting and stopping over and over. It took us forever to get to Ojai from LA! We rented a convertible, too, though, so at the same time it was kinda nice to be slow because it allowed us to take in all the sights even better than if we had been going 45-50 mph! Awesome itinerary!! I've been to LA a couple of times and other parts of California but need to get to Napa and Santa Barbara! This makes me want to do the trip again asap! I loved driving the coastline! This is an awesome itinerary! It's so hard to gauge which spots will be worth more or less time. I'm happy you guys didn't have much traffic because Malibu/Santa Barbara areas can get backed up at weird times. How fun was the convertible?! 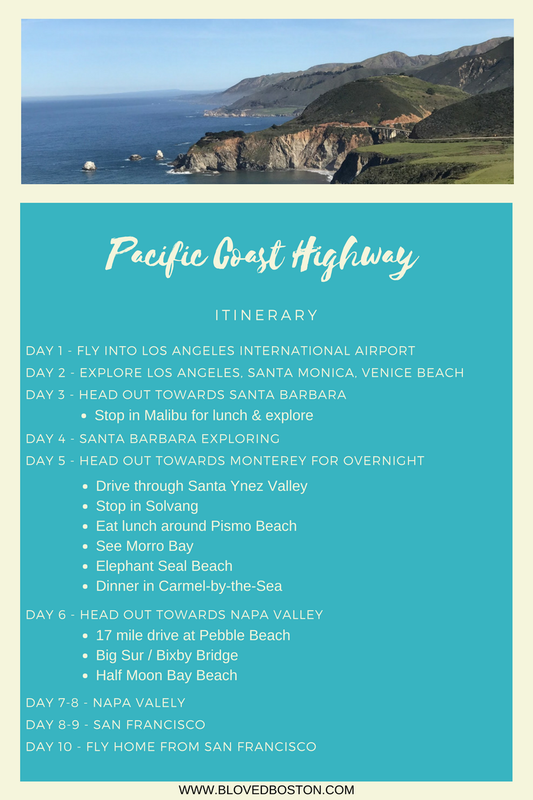 I've always wanted to do a road trip along the Pacific Coast Highway! My boyfriend grew up in California and has done the drive a couple times--I'm always super jealous of his pictures! I love this! Seriously what a wonderful post with so much helpful information on it! I love the photos too! You guys have some of the best trips! Wow, how helpful that you've shared an itinerary! When traveling, it can get so overwhelming with trying to do and see everything, especially in such a short amount of time, so having something like what you've shared here is great, even if you won't be staying for a full 5 days, you can pick and choose. Thanks so much for sharing your visit with us, it's been fun reading about your adventures and getting a feel of what to expect, since I've never been to Cali before. I hope you have a wonderful week ahead, beautiful! Definitely saving this post for when we start planning our trip out to the West Coast! Hopefully it's sooner than later :) Have a great Monday! This is on Stephen's and my travel list - so I'm pinning this when we finally get to take this trip! Loved all of your recaps of your trip! This guide is so perfect! I love how you broke it down. It's on my bucket list for sure! So fun!!! Thanks for sharing! Totally pinning this post! Steven and I want to go to California later this year but we can't decide where to visit. This is SO helpful!!! I've loved getting to read all about your trip and I think hat we probably would have picked to drive south to north as well so we could relax in Napa at the end of our trip. Talk about the perfect end to a vacation! And 1000 times yes to a convertible! You really can't beat it! I have certainly added a drive up..or down...the PH to my bucket list. It looks and sounds like you guys had such a great time! And clearly the only way to do it is with a convertible! Such a fun trip, so many beautiful things to see along the PCH. I'm probably the only person in the world who hates convertible's, the noise hurts my ears. LOL. Your guides have been helpful. I've never been to the West Coast and my husband hasn't been in years, so I don't think we would know where to start! Such great ideas! Totally bookmarking this! Definitely saving this post for the future :) Your trip looked like so much fun! Thanks for sharing your detailed itinerary! PS- You are more than entitled to "just be" sometimes! Glad you're back though! Love that you put this together, definitely saving it for a future trip. Happy Monday, girl! Oh how I miss PCH!! Great itinerary! Next time I will fly to West coast, it will be for San Francisco. I loved reading about your road trip. 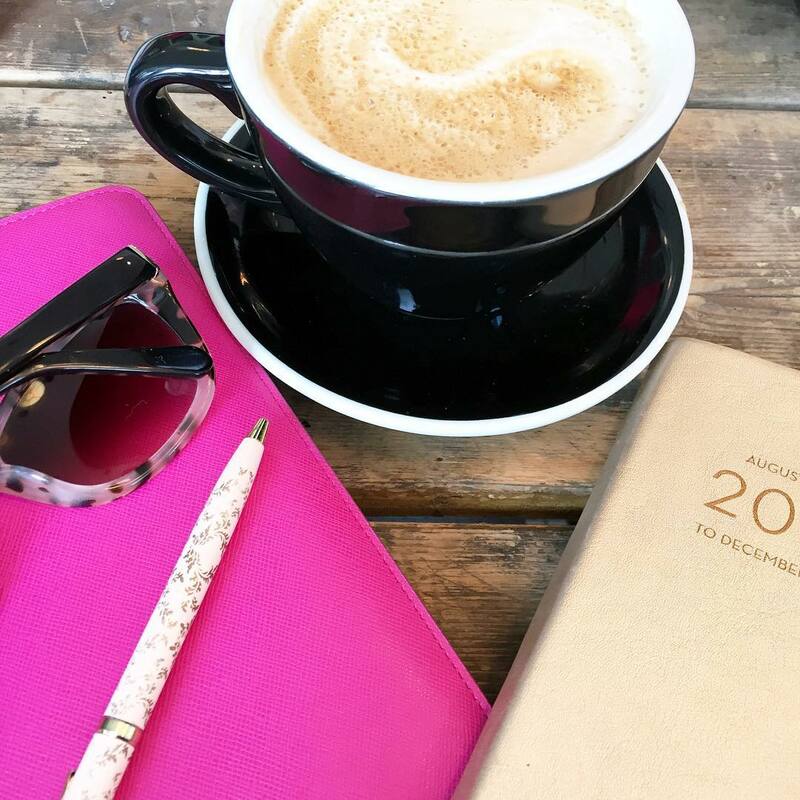 I love that you shared the itinerary - I always enjoy seeing how people break down a trip! 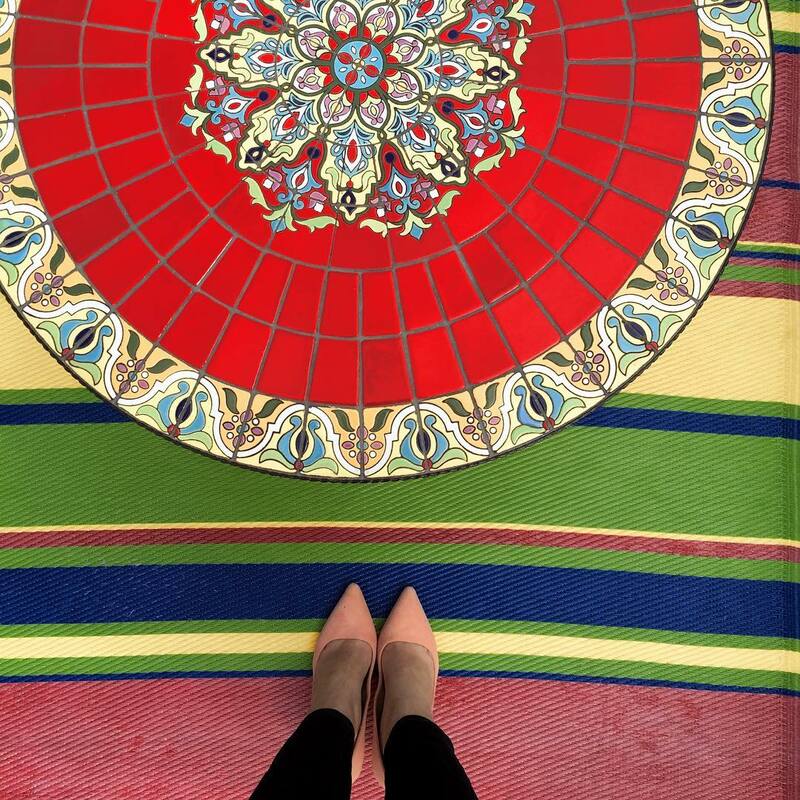 I've loved reading about your trip - it seems like you guys had the best time in each place! I've always wanted to drive down the Pacific Coast - it sounds so amazing, and I was obsessed with all your grams! I hope I get to do it one day or at least make it to Napa! This trip looks amazing! I need to take a trip down to the west coast now! Awesome recap! I love your itinerary! Both times I've done the whole Cali coast, we did North to South to end relaxing in San Diego, but as an adult, I totally agree with the end in Napa. LOVED this post! This trip is on my list - just pinned! This is super helpful! I felt a little overwhelmed by the trip down the highway. How was the traffic around LA compared to what you're used to in Boston? That sounds like an amazing trip. Your posts have me dreaming of the California coast!! We did seven because that's all we had, and I agree that we could have been happy with two or three weeks there! I can imagine how daunting it is to plan a trip like this when you want to see and do everything as much as possible and then figuring out the logistics of what makes sense when you're not familiar with the area. You're itinerary, I'm sure, is a huge help for those planning a trip along the PCH. I'd love to do the trip myself one day but Europe has to come first so it may take a few years to come to fruition! That sounds so fun! I always thought that would be a great trip. These are great references for a future trip! This seriously sounds like so much fun! I have been dying to do a Cali road trip! I want to see Big Sur so bad! The California coast is so gorgeous! I live there and I agree even 10 days to see it is a little rushed but definitely enough time to see the major things! I love driving through PCH!!! You're making me want to go back to CA asap!!! We did PCH from Seattle to San Diego growing up and it was such a memorable trip! I loved driving up the PCH when we lived there, it's the most gorgeous drive ever! Also, can we discuss that picture of you in the car? It's beyond! This is just the travel inspiration I needed. We have to go to a wedding in Napa and just decided to make it a weeklong trip! What a great itinerary with beautiful experiences. The coast is beautiful! Sounds like a great trip! Wow, this a great travel guide post! I am really impressed!! I also really want to go on a trip now haha. Thanks for sharing and I hope that your week is off to a great start! I'm amazed at all you were able to see on your adventure!! 10 days is such a luxury to make such a trip, but it seems like it was worth every minute of it and you were able to cover so much ground! These are all such great places to see heading North! Next time, come down the coast - Long Beach, Newport/Huntington, Laguna, Dana Point, (Then you can see san juan capistrano missions) San Clemente, San Onofre, Carlsbad, Encinitas, Del Mar and end the trip in San Diego. Perfect itinerary!! I have never done it all at once. BUCKET LIST!! Have an awesome weekend Biana!